More Blog Posts in NAAE Virtual Book Club Where is this place located? Coincidentally, my favorite board game growing up was The Game of Life. I loved the different career paths you could choose, and I always hoped to draw the Farmhouse from “Euell B. Milken Realty.” I also always hoped to retire in Millionaire Estates (isn’t that the dream?). After reading the first few pages of Chapter One, we see a description of Wade and Hope’s childhoods and how they are very different. The essay that they refer to about life actually not being like Monopoly can make you take pause. Wouldn’t it be wonderful if we all started in the same space at the same level, and be assured that extra $200 as we pass GO? Yes, but that is not reality for our students or for us. However, in this book club space, we are all starting at the same place. We are starting at page one together. But, before we delve in, let’s meet our players! If you could design your own game piece or player from any game (digital/board/certain card character) to represent you, which would it be? What game is it from? Why that specific one? Or, do you have a character that is all your own (plot twist!)? Please share a picture of the piece and a short explanation, or link a video as a comment to this post. Hello, I am heading into my third year of teaching in the sunshine state I think my favorite game as a kid was Candy Land probably mostly because of my love of candy? But I think my game piece would be the board. I love how bright and colorful it is and all the characters on it. I think this piece can represent lifes path. The path to where I was going sometimes had set backs, short cuts, and I never really knew what was around the corner. It has ended up being very rewarding none the less. Hi, I am going into my 6th year teaching in Southeast Oklahoma. My favorite game has to be a domino game called “moon”. It takes a partner and strategy. You have to learn to rely on your partner from time to time to make the proper moves. My name is Sarah. I currently teach Horticulture, Floriculture, Greenhouse Management and Biology in Bristol, Virginia. My two sons just graduated from the school I teach at. Both are headed off to college in two separate directions. One will be playing football and the other will be in the marching band at their respective schools. I feel that the fact that they will both be playing on the football field but in totally different ways symbolizes my husband and I. He was the high school athlete and I was the band geek. I also have a daughter who plays tennis and volleyball. I don't know that I had a favorite game growing up, but now my favorite games feature my favorite people. If you ask my kids my favorite game is any matching game I can play on my phone. It helps me to check out and de-stress, which with three teenagers at home and the dozens at school is a necessity. Scott, I’ve actually played such an intense game of spoons where people ended up bleeding (nothing severe). Such a unique sounding game! You should bring it around sometime so we all can play! Hello! I'm Nicki Honan and a 17 year veteran teacher from NW Missouri. I teach at West Nodaway which is a small school (250 students - PK through 12). My husband grew up farming in the area and this is what has landed me here until eternity! LOL! Throughout my childhood, I had a almost perfect role model in my life and it was my great grandmother (I say almost perfect because she tried feeding us raw tomatoes and zucchini daily as children - which we hated - but now we laugh about it and love both). During the summer months, we would go to her house and play cards in the morning and then swim in the afternoon. We LOVED playing cards with Grandma Ruth because sometimes I feel as if she'd mess up on purpose just to let us win. We played games such as rummy, 7-UP, and king's corners. My favorite of these is rummy. This card game reminds me of the way I try to plan my lessons in the classroom. If you have ever played this game you know you could be at the luck of the draw but it's the critical thinking and problem solving which go into the decisions you make that prove if you'll be the winner or loser. I recently tried teaching my daughter how to play this game and then reminisced with her about my great grandmother. As agriculture teachers, we get so caught up in the moment that we fail to forget The Game of Life little things that make us who we are and what got us to that point. I don't know about you but I couldn't stop at reading just the first chapter. I finally put the book down when I was into the second part and thought I should stop so I don't get lost on the assignments. The authors perspective for this book are totally different, just like each one of us. I hope to learn and grow from this experience and absorbing what each of you have to say along the way. Catch Phrase... Always trying to explain and get things across in the correct format but knowing that everyone maybe hearing a different version. We have many different students that learn in so many different ways so we have to find new and creative ways to explain the same content to the different students. We have one wanted outcome and it can be said or taught in many ways. I love this game and actually use it in a variety of ways to have students learn the different content that I teach. My name is Courtney May and I just finished my sixth year of teaching in Southwest Iowa. Like many of you, I did not play a lot of board games, but grew up playing card games on the holidays or when hanging out with my grandma. The two card games that were the most popular for us were double solitary and Kings in the Corner. Now I'm not sure if "Kings in the Corner" is a "real" game or one grandma made up, but it was fun! Card games relate to life in several ways. Each person is given a random hand and that hand changes each game, but winning is dependent on how we react to the hand we are dealt and how the cards are played. In life we have to react to the events and people that we encounter. In "Kings in the Corner" the goal is to organize from Kings down to Aces in the corner. I like to be organized in most things that I do, but as high school teachers and FFA Advisors we know that organization doesn't happen like we want it to. When we win at solitary on the computer we get to watch confetti and fireworks go off. I equate this to the success of our students successfully mastering new skills or succeeding in contests, etc. Hey there, I am going into my 5th year teaching in Northwest Arkansas. Growing up my family always played Scattergories. I feel like this game can relate to our roles as teachers because now matter how we roll the dice or what list we are playing on we have to do something with it. We can't just sit there and hope something good happens. With this game you can end up with some pretty funny words but also some serious words. It's the same with our instruction in class. Sometimes we can have fun and laugh and get the students engaged and then sometimes class calls for an important discussion on an important matter. At the end of the day, if the students have learned something then I feel like my goal has been accomplished. This might be a stretch to remember but I came to Manheim's banquet back in 2010 and spoke as the County FFA President. Hope all is well there! Karen Van De Walle here, starting year 15 here in Iowa. Favorite board game, hard one being the youngest of 5 my parents were done playing any games and all my older siblings were done playing games as well. But today a game I like to play is Yahtzee. I know it isn't a board game per say, but that will do. I like the possibilities with the dice. I am a CASE teacher and lead teacher to boot. I find myself at year 15, I feel like I need that ice bucket to wake me up and remind me why I went into this profession. I know I am here to make changes in students lives. But I don't feel like I am very good at it anymore. That engagement is gone, or at least less. I am hoping that will come from reading this book and having discussions with all of you fine people. Looking forward to hearing from you!!! Hello everyone! I'm Ashley Mattke. I am going into year 3 but next year as industrial technology instructor at the same school. I did this book club last year and figured I would do it one last time before the whole career change. I don't have a specific character that I can relate to or think of right now. I feel like I have been running around with my head cut off for the last couple years and especially now this summer with having to finish up FFA stuff with kids, classes, and just the normal day-to-day. So if there is a game character out there like that then that would be mine! There are a lot of great cards in this set! It has 28 pairs of things - animals and farm equipment. My name is Star Schipper and I am the 2018 NAAE Professional Development Intern for the summer, and through this I was given the opportunity to join in on the Book Club! I was a very avid board game player as a child, when people would play with me that is. 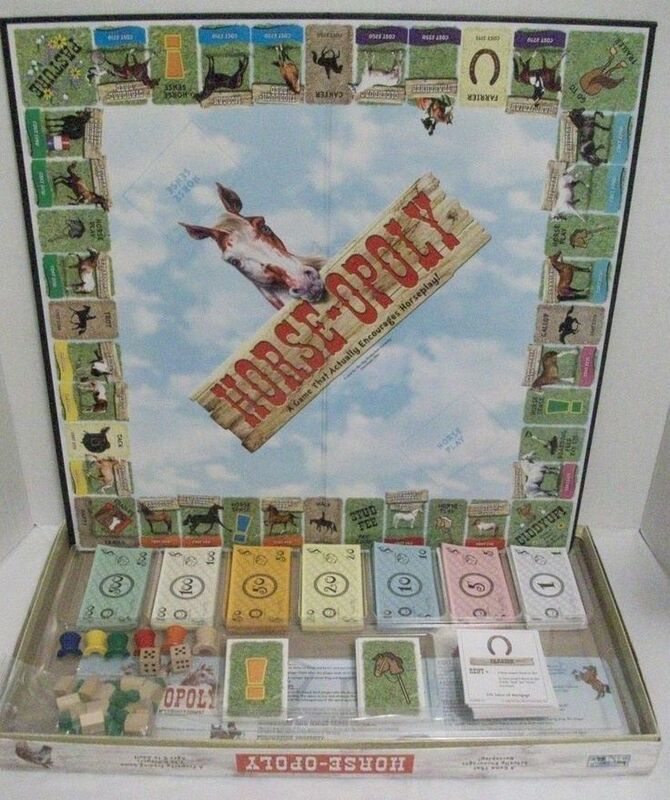 My favorite board game is Horse-opoly (a horse version of Monopoly) because I have been obsessed with horses since I was little. I loved the way that the board was set up with the smaller horses at the beginning all the way to the draft horses at the end, and I think that this ties into the classroom because you have to start small, with the basics in order to become something great. You have to build your self up to learn what you are good at, which I think teachers play a big role in students lives. I also really like all the different varieties of horses that are all valuable to winning the game, this shows that you have to build the right team in order to be successful, but I also think that this shows that your strengths might not be someone else's strengths which is not always a bad thing. I am a firm believer that in order for us to be successful, we need to build each others strengths instead of focusing on the weaknesses. Any way, I am really excited to read all the responses and learn all I can from this book! I totally agree with what you said about animal therapy! My family and I also played Monopoly for weeks and ended with no real winner! I think that's the real beauty of the game is you can end it whenever you want or you can keep playing to increase your odds. I think that this can be tied into the classroom from the students perspective (as I am still a student) I think that we can all get educated until we feel we are ready to enter the workforce, some enter early and some take years, but I think that teachers have a real impact on our successes no matter when we leave school. It's crazy to think that I will have taught more students this year in 7th and 8th grade than you have in your whole K-12! I love Catch Phrase. We often play it at "Girls Night" when we are not playing Left Right Center. So I inherited the set-up from another teacher, but it works! So I have half of my lab set up for small engines and half of it set up for actual labs. I have three cabinets that are dedicated to the Food Science class, and I don't have many appliances. I plan on requesting some small appliances (hand mixers and toaster ovens). But all we have are hot plates and some pots and pans for a majority of the cooking labs. There are some labs that will require an oven, but we are lucky and the FCS teacher upstairs likes us enough to let us use her equipment if it doesn't interrupt her classes. Once my lab isn't torn apart I can take a picture, but with it being the end of the school year they are cleaning the floors and all of my tables are stacked on top of each other. I am Lucas VanEgtern, and I currently teach at Dodgeland in Wisconsin. I am going into my fourth year as an educator, and I am enjoying the strategic game of being an agriculture teacher throws at me each day! For this initial post, it took me a little bit to reflect back on what games I played as I child and pick which one I enjoyed most. Then, it clicked! Playing characters can represent the students you work with. They have different qualities and strengths that make them unique. Using certain tools, you can power them up and unlock their potential. Enemies can be compared to the many obstacles the students face in their educational path many of which were discussed as excuses in the first section of the reading. In the game their are 12 missions and they can be played on varying difficulty levels. In the classroom, we have standards and objectives that must be completed by our students to demonstrate mastery of the expected targets. Additionally, we need to differentiate to meet the needs of all learners from our lowest to our highest. At the start of each mission only a portion of the map is available to see and build a basecamp, and the rest must be uncovered. This makes me think of how students start our classes with some base knowledge. As we go throughout the semester, year, or high school career, they uncover their map to see the bigger picture either of their post-high school plan or that specific course. I could continue to describe some of the cross-overs, but I believe we get the picture! So far, I am intrigued in what this book will offer for additional tools to use in my classroom. I look forward to the upcoming sections and discussions! This is Barb French. We played many board games. This post will be short because I have been having trouble with the iPad tonight. I think the game piece that I would pick would be a black checkered. When playing checkers, You try to understand the opponents thinking. This is what I do in class as well--try to understand what my students are thinking in order to better guide them to the information or the process they need to know. Sorry I wasn't able to upload a picture. My name is Darcy Nekolny, and I just finished my 11th year at Oakwood High School in East-Central Illinois. Growing up, my family played lots of cards. Rummy, solitaire (if nobody else wanted to play), kings on the corner, euchre...you get the point. Last week at CASE NRE I was asked to identify a strength of mine. I'll be honest, when it comes to being an ag teacher/FFA advisor, I know there are days I excel, and I know there are days I don't. I know there are subjects I'm well versed in, and there are others I hope the kids don't see through my smoke and mirrors routine. So, like I said last week, and what will be my game piece this week, I identify as the jack of all trades, master of none. I teach in a small school with ag offerings that are mostly ag-science based, but not completely. My ability to pick up information and run with it, or being the jack of all trades, makes me able to teach seven unique preps in a six prep time. While I'm efficient at this, I'm not necessarily effective, which is where this virtual book club comes in! I hope to gain some new ideas to try in the good ol' ag room! Well it’s humbling to realize that I didn’t remember that or recognize your name, but I have more and more trouble remembering names as I get older...please don’t take it personally! I’m glad you joined the profession though. It will be good to reconnect as we read Wild Card. Our family is pretty competitive over spoons as well. It’s so fun!